I have to thank Lil’ Sis for the inspiration for this post. It’s the story of one of the earliest instances of interactive entertainment, a TV program that even Bill Gates once saluted as a revolutionary use of the medium — a 1950s show called Winky-Dink And You. We had one of the kits at our house too and I remember it well. My sister would have been closer to the ideal age for the show’s audience, but even if I was theoretically a little too old, I’m sure I stuck my nose into the process pretty regularly. Although the show did stick around for several years and remained popular, it might have been doomed by something that sounds funny to us now but was dead serious at the time. A lot of parents began to wonder if it was dangerous for kids to spend so much time so close to TV sets. It was still new technology for many people and they weren’t too sure about all those mysterious rays coursing through the air — and never mind what it might do to the kids’ eyesight! It’s hard to say whether that helped hasten its end, but the show was eventually taken off the air — though it did make a brief comeback in 1969 as a fully-animated program. And current nostalgia buffs should note that they can still buy a kit — complete with DVD — and visit with Winky-Dink to their heart’s content. Okay, I’ve given this considerable thought and have decided to ‘fess-up’ about being the previous owner of a Winky Dink Kit. I even remember having one I got from somewhere that was a translucent green. I think it was supposed to make you think you were watching color TV but I can’t be sure. Seems like it might have had something to do with “Rocky & Bullwinkle”. Anyway….thanks for the memories! I think you might be right about the greenish color — or maybe that came along later (and probably cost more). In a similar vein, I remember an uncle who sent away for a ‘color TV’ kit that was advertised in magazines in those days. It was just a rainbow-colored plastic sheet that you’d stick on the screen. I did this, too! I ordered the kit and drew on the screen. herd to believe now, but I did it. Had a secret decoder as a member of Captain Midnight’s Secret Squadron, too. They gave you a coded message at the end of each show and you could decode it using a little wheel to relate numbers to alpha. My badge number was 185622. How come I remember that and nobody’s phone number. Remember the captain’s sidekick, Ichabod “Ikky” Mudd? Your post got me to thinking about favorite characters that I remember watching on TV. I remembered that I used to watch the Tom Terrific cartoon….I think it came on Captain Kangeroo. It had a character called “Crabby Appleton” and the song about him sticks with me today. It went “he’s Crabby Appleton, and he’s rotten to the core.” I thought of this the other day when my significant other was grousing about things. I called him Crabby Appleton and told him he was rotten to the core. Heh, he didn’t have a clue what I was talking about. I actually looked it up and saw that there was a band in the 70’s named that too. I didn’t remember the band though. 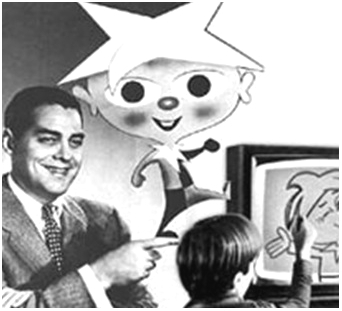 By the way, I do remember that my Winky Dink tv sheet was a greenish shade. Crabby Appleton! My best friend’s mom always used that epithet on any of us kids who was being a bad sport. I never would have remembered the song, though. Nice going! Whenever I think about Captain Midnight, I seem to visualize Captain Video. Remember him? Thanks for all the comments, everybody!